i see on here and on some websites that there are 3 and 4 bolt flanges for the turbos on these cars. is there an advantage to switching to a 4 bolt over the 3 bolt that comes stock on gn's. guess what i am looking for is the good the bad and the ugly. 3 bolt vs 4 bolt. A long debated topic. In a nut shell, here's the good and bad. Garrett 3-bolt turbine housing on a TA-49 turbo. Factory located 3-bolt turbo with a 3" Terry Houston downpipe attached. Factory style 3-bolt turbo with external wastegate mounted off the downpipe. Direct bolt on replacement for all 86-87 Turbo Buicks and TTAs. Largest bolt on 3-bolt turbo available without having to change around a lot of stuff is a PT76 GT-Q. Uses the factory style downpipe flange for stock downpipe, Terry Houston style, or external wastegate mounted onto the downpipe style. Factory heat shield will fit over even the PT76 GT-Q. Limited flow capabilities once you start looking to make over 975 fwhp. GT-Q is currently the largest turbine wheel option available. Back pressure can become an issue when trying to hit the elusive 975 fwhp mark. Wastegate hole will need to be ported if wanting to run high hp and high boost levels with a standard Internal wastegate style downpipe, in order to maintain boost control. To anyone that knows how to recognize turbos, the larger 70 series turbos would frighten most. PT88 Stage II setup with external wastegate and V-band style downpipe. 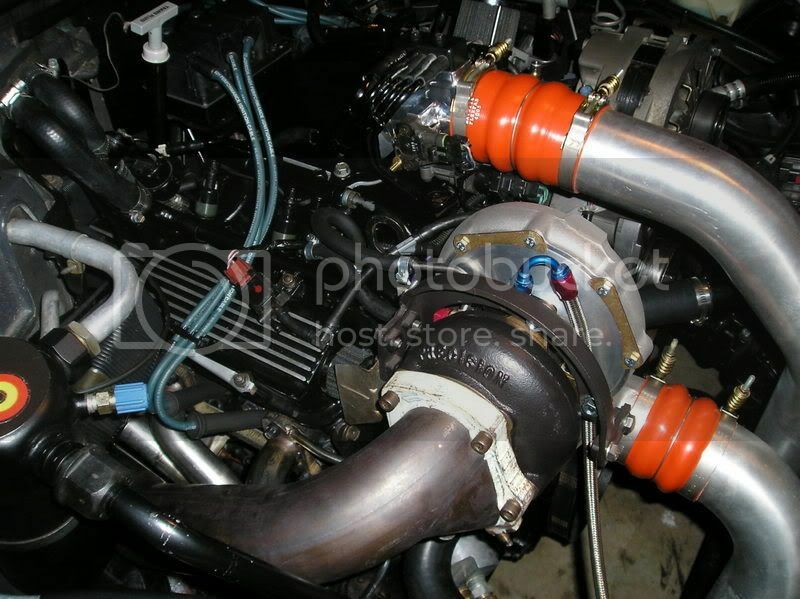 GT42 series turbo on Stage II with external wastegate and v-band style downpipe. Tremendous flow capability when using the T4 Tangential style turbine housing. Significantly out flows the 3-bolt T3 style housing on 800+ hp applications. Less back pressure at high boost than the 3-bolt. Turbo selection and hp capabilities far exceed the currently available 3-bolt turbos. 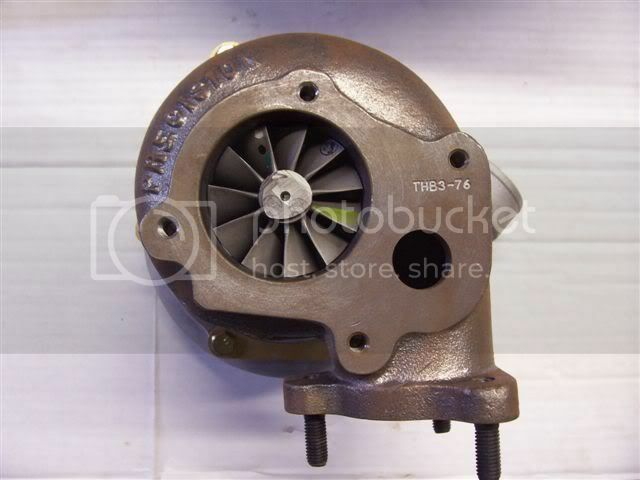 You can get a GT4788 with a T4 style turbine housing that will support close to 1300 fwhp. Requires the use of an external wastegate that will need to be mounted either onto the crossover pipe, or off the up-pipe from the header. Requires specific headers or at least a 3 to 4 bolt adapter flange. Will not work with internally wastegated downpipes. Requires a different style v-band clamped downpipe. If you go larger than a PT76 GT-S, you will need custom air intake piping as most turbos larger than the PT76 have 5" inlets. Higher than 4000 stall converters are required to properly spool up non ball bearing turbos larger than a GT4276, even no Stage II applications. Factory heat shield will not work and on larger Medium framed turbos, and will typically scare the poop out of most on lookers. Awesome little write-up on the differences between the 3 and 4-bolt turbos... Great use of pics as well! This might make for a good sticky! And you always do. I love toread your answers. I learn. 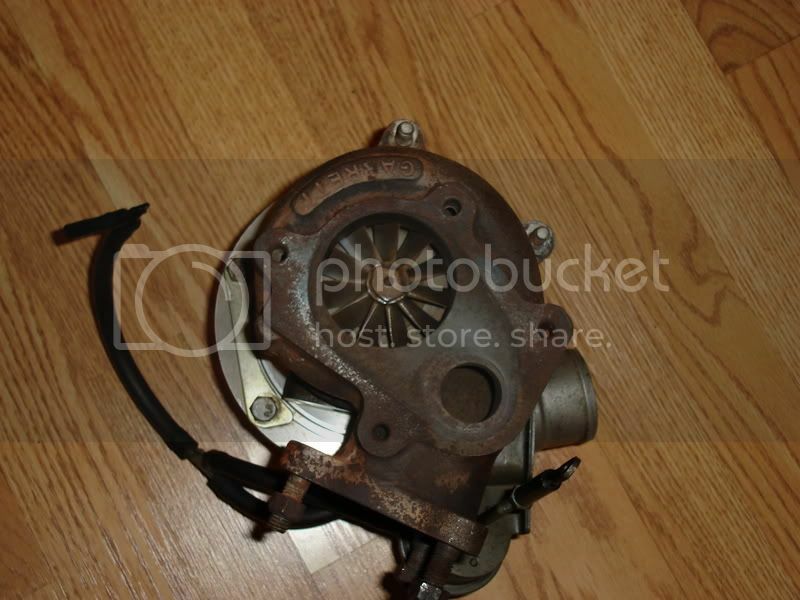 What about sealing of the turbo to header, which is easier/harder to get a good seal on it and keep it? Technically, they should both seal just fine when used with a copper gasket and some copper high temp rtv. The T4 would have more clamping force due to the 4 bolts vs 3. Precision should have some left on the shelf. PTE part number 074-1017, 3-bolt to T4 4-bolt adapter inlet flange. Last price I had was $53.99. Will this throw off the alignment of the downpipe? Using a GT4788 with a T4 housing and a hp level of 1250hp at 45 psi boost, what kind of back pressure can be expected? At what point is it best to just go with the T6 housing? I guess this is still a grey area that people are experimenting with. I bought a "rebuilt" turbo about 4 years ago and am finally getting around to adapt it to my non-Buick engine. It was supposed to be off of a Regal but just recently someone looked at it said it was not. I have attached some pictures of it here and would appreciate any response on what it came off of. I've been out of the performance game for many years and am trying to get back into it so please excuse my ignorance. one question?i just bought a four bolt turbo and i was wondering if theres a adapter to make my three bolt downpipe to and four bolt.anyone know of such of thing. Not sure but I had one came off a turbo Riverera.Nw I'm not saying for sire. But it is not one for an 86 to 87 buick. Just don't know. Sorry.